A tribute from this year’s Choir President and Chairman – Peggy Evely. 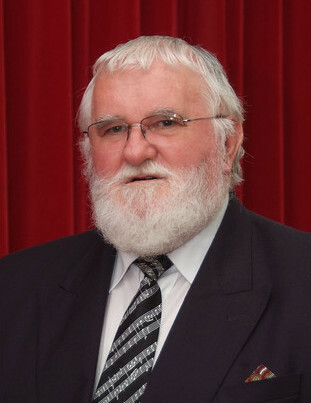 It was with great sadness that I learned of the sudden death of our accompanist George Smith on Sunday 9th March 2014. George sadly died in his sleep early that morning at his home in Truro, where he lived with his wife Karen. 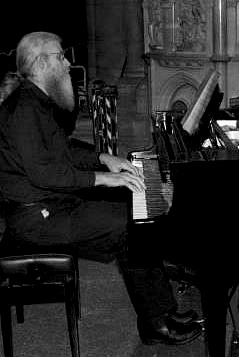 George was appointed the Choir’s accompanist in the autumn of 2005. 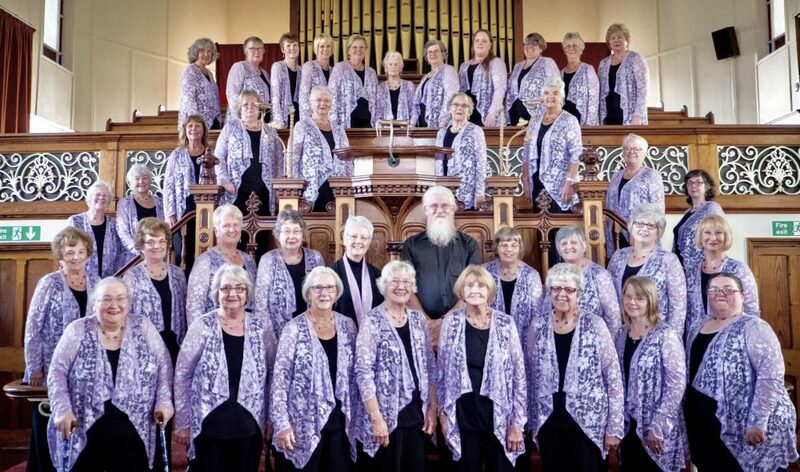 For several years prior to that the Ladies’ Choir relied on the help of various accompanists, so, when George agreed to take on this post, we were all delighted to have such an experienced musician in our midst. George was an accomplished musician who supported “His Ladies” through thick and thin. He sometimes took our rehearsals; he’s conducted the Choir at concerts, arranged music for us and regularly played piano solos at our concerts. Interacting with us and our MDs in rehearsals was a regular occurrence as he like to give some helpful hints, when he often used his favourite phrases, such as “If you know where I’m coming from”, “Singing from the same hymn sheet” and “if I may interject”. Hearing him say these phrases used to make us smile – knowing we’ll never hear him say these phrases again is almost unbelievable and difficult to comprehend. His last words to us were “Goodnight ladies see you next week”. Sadly for us, next week never came. George’s love of music was infectious, he was a joy to listen too, he played with such feeling and he gave us all such encouragement. 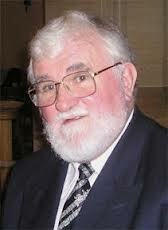 George was a truly humble, caring gentleman; he had a great sense of humour with a deep infectious laugh. George can never be replaced – he will be sorely missed by all of us and everyone who knew him. Thankfully for us, we have some treasured memories, which can never be taken away. Here are some thoughts and memories from members of the choir. Anne-Marie:- As soon as I joined the choir I was struck by George’s tremendous passion for music and friendly welcome – this joy was infectious. Audrey:- He was always smiling and cheerful. He cared about others and really loved “his ladies” I found George was a true gentleman and I will miss him greatly. Babs: We could always rely on George – he was a great support through thick and thin. Connie: To have George, a wonderful musician, as a dear friend, has been both a joy and a privilege. He will be sorely missed. Hazel: My abiding memory of George is him sitting with his feet propped up, eating a banana during the break on practice night. Also his booming, joyous laugh when someone said something which tickled him. Jean: A hard act to follow – such a talent. Judith: When I became 70 last year, George said “ I’m right behind you”. I’ve always thought that George would make a good Father Christmas. Liz: He had a lovely smile and a hearty laugh. A wonderful musician who will be missed by all who knew him. Pat: I shall miss watching and hearing George play. He always put so much feeling and sensitivity into his performances. We will never be able to replace him. God Bless. Mollie: I have not been with the choir long. It has been truly lovely to hear George play, to see him smile and to hear his witty comments. God Bless. Monica: A lovely, gentle man. It was a privilege to know George, albeit for a short time. Listening to him play was a delight and the pleasure he got from his music was obvious. Margaret: George was always very kind and caring. He was also a great support to our MDs and gave suggestions in a very humble way. His musical knowledge was extensive and his stories will live on in our memories. Mary: I think of George in his red waistcoat at Christmas reminding me of a jovial Father Christmas with a lovely smile. Peggy: It was a privilege to have known George, his enthusiasm and musical ability will live with me for ever, he was such a talented man. George enjoyed Bananas, so I hope there’s Bananas in Heaven!! Rachel: My memories of George are of him making himself comfortable during concerts using his walking stick to rest both his legs and his deep, infectious laugh. Suzanne: George was a true gentleman. When my Mum came to a concert on her birthday he played “Happy Birthday” and got everyone to sing along. She has always remembered this. Stephanie: Always patient and thoughtful during rehearsals – fantastic sense of humour. Sylvia: The music in Heaven will improve now that George has arrived! Ursula: George had many wonderful gifts as a musician and he passed these on to we choir members. We will miss him so much. Val: George’s best known phrase was “You know where I’m coming from” We would count how many times he said it during practice! Vivienne: It was a privilege to have known and worked with such a wonderful musician. We have a collection of George-isms to remember him by!